Jesus today provides a miraculous meal for the crowd following Him, an event that looks back in history and forward to the future. How? St. John tells us that near the Sea of Galilee, a large crowd was following Jesus, because they had seen Him miraculously cure the sick. Although He and His disciples “went up on the mountain,” the crowd pursued them. Then St. John inserts a detail that seems extraneous to the story: “The Jewish feast of Passover was near.” The action here has nothing to do with Passover—or does it? Why does St. John place it within a Passover context? The only possible relationship between this story about people eating and Passover is that both feature a meal. Surely St. John wants us to make that connection, keeping it in mind as the story unfolds. As the crowd approaches, Jesus asks Philip, “Where can we buy enough food for them to eat?” Now, the story gets really interesting, because St. John tells us the question is a test. What answer was Jesus looking for? Did He expect Philip to know that He would miraculously feed the crowd? In the one other public miracle (His first) Jesus performed with food, His Mother, Mary, had understood that a shortage of wine needed to be addressed to Jesus Himself (see Jn 2:1-11). Did Jesus expect Philip to follow Mary’s example? Philip is not thinking about a miracle. He’s not even thinking about the question Jesus asked. The question was about “where,” but Philip is thinking about “how.” His mind is on the shortage of money, not the food. If he had been thinking about the lack of food for so many people, he might have remembered a foundational event from Israel’s history. When Moses delivered God’s people from slavery in Egypt, they experienced food shortages in the wilderness. The remedy was God’s provision of “manna,” bread that rained down from heaven at the start of every day for forty years, keeping the Israelites alive on their journey home to the Promised Land. Andrew, Simon Peter’s brother, was a little closer to the mark. He was not thinking about Moses and the manna, but he was perhaps thinking about another food miracle in Israel’s history. When Andrew noticed that a boy had “five barley loaves and two fish,” was he reminded of the story of the prophet, Elisha, who had once miraculously increased barley loaves to feed a crowd (more on this in our First Reading)? His muted question (“What good are these for so many?”) suggests he thought that it was at least possible Jesus could do what Elisha had done. If so, Andrew was right. 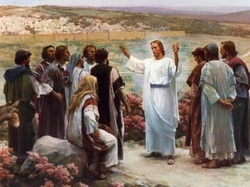 Jesus had the whole crowd “recline” on the grass. This is an important word in the story, because it evokes a future event that also took place at Passover. For the Passover meal, Jesus and His disciples “reclined” at table (see Mt 26:20). Using the word twice in this story, St. John doesn’t want us to miss its relevance for another miraculous meal—the Passover meal during which Jesus instituted the Eucharist, bread and wine from heaven, as the new observance of God’s deliverance of His people. The Passover lamb commemorated Israel’s freedom from physical slavery. The Eucharistic bread and wine commemorate and make present our deliverance from sin and death. The Lamb of God is our new Passover meal. All the hungry people were fed by the miraculous multiplication of the loaves and fishes. Jesus turned the impossible into the real. In fact, there were even leftovers, representing a superabundance of God’s provision for the needs of men. This echoes the declaration of the steward at the wedding in Cana, when he tasted the miraculous wine and recognized that it was far superior to even the “good wine” the bridegroom served first (see Jn 2:10). What a rich metaphor this is for how God provides for us—our “impossibles” become “more than enough” and “the best”! Possible response: Lord Jesus, I love this picture of You feeding hungry people in the most amazing way. Help me remember this when I am starving for Your help. Elisha, the disciple of and successor to the prophet, Elijah, lived in the 9th century B.C. It was Elijah who called down fire from heaven on Mt. Carmel as he urged the people of Israel to forsake their wanton idolatry and return to their God. Elisha was his younger associate. When Elijah was about to depart from this world, he asked Elisha what his last request of him would be. Elisha asked for a “double portion” of Elijah’s prophetic spirit (see 2 King 2:9), and that’s what he got. He worked many miracles and had a vast ministry among his people. In our reading, we see that a man had brought to Elisha barley loaves “made from the firstfruits” of his crop. This would have been rendered as an offering to God’s holy prophet. Elisha needed to feed the company of men who were with him (likely a school of prophets), so he commanded that the bread be given to them. The servant sees the impossibility of feeding so many with so little. Elisha insisted, and uttered a prophecy from God as well: “They shall eat and there shall be some left over.” It happened exactly that way. In our Gospel, it is quite possible that Andrew had this history in mind when he told Jesus about the barley loaves and fish. Interestingly, Jesus Himself was a younger (by only three months, of course) prophet than His cousin, John the Baptist, yet He could be said to have a “double portion” of the Baptist’s spirit, in that His work was greater than John’s. Likewise, Jesus told His disciples, when He was about to leave them, that they would do “greater works” than He, once He had gone to the Father (see Jn 14:12) and sent the Holy Spirit to them. Jesus, at the Last Supper, gave miraculous bread and wine to the Twelve; their successors today feed the whole world with this heavenly meal. Possible response: Father, forgive me for the times I have doubted You could meet the needs that press in on me. Possible response: Father, Your food is meant to nourish me for holiness. To that end, please help me to be a peacemaker today, always seeking unity.